Cragg's Island is located south of the Red Obelisk and comprises the southernmost point of The Island. Its location provides several advantages for survivors. It's small size makes it relatively easy to clear of predators, creating a safe zone for communities. A densely-wooded hill with a clearing on top has ruins and an explorer note, and provides a good view of the surrounding area, particularly to the northeast. Cragg's Island is bounded by ocean on three sides and separated from the mainland by a river to the north, making it easily navigable by boat, but for those seeking isolation there are also dense forests, cliffs and quiet shores in the south and east. The shallow stream bisecting Cragg's Island and river to the north are excellent sources of fish, and river rocks are a handy source of metal for new players. Its proximity to the red Obelisk is beneficial for those wishing to transfer tamed animals or items between maps. And the Writhing Swamps are close enough that an expedition to gather valuable resources such as Rare Mushrooms, Rare Flowers, Leech Blood or Plant Species X Seeds does not take too long. The island is surrounded by the sea to the south, west and east. In the north a river separates the island from the Footpaw and the Southern Jungle. One of the more friendly locations for new players. While carnivorous dinosaurs can be found on the island they are relatively rare, and almost never appear in groups. 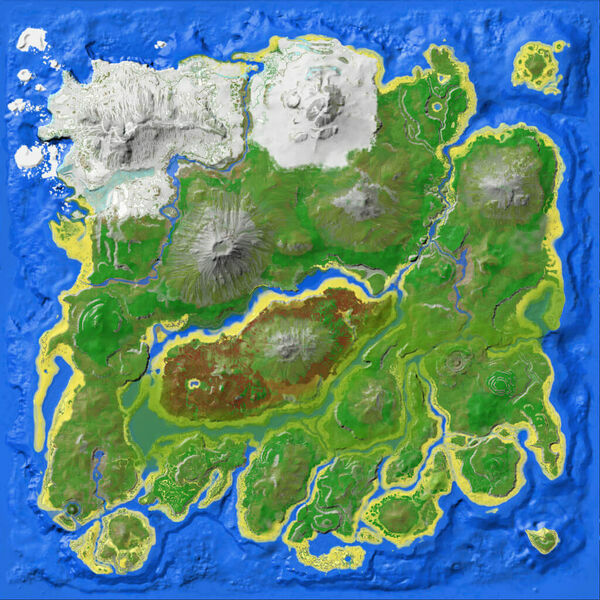 Rivers around the island will commonly have Piranha and deeper waters will have Megalodon, making it more dangerous to cross into the island, however the large amount of relatively low level and easily tameable dinosaurs make it a good location for a starting base. However, Therizinosaurs can pose a threat to new players and tribes. Wooden Pillars can be used to build a bridge for safely crossing in and out from the island. Cragg's Cliff (sometimes called Cragg's Rock) can be a Great base location for PvP, keeping out unwanted players or tribes from getting in on ground. The rock can be used as a Fort as well as an air pad for flying mounts. A Navy base is also an option. Quetzals can be found here from time to time, if you can't find one, you might have to wait for one to respawn.